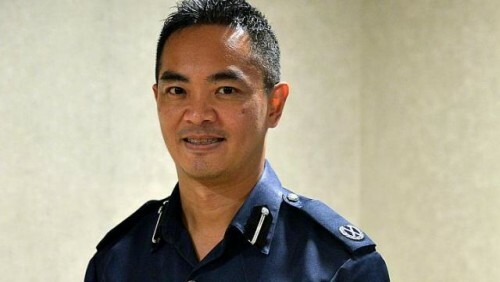 FROM the kidnapping of the Sheng Siong boss' mother to the Little India riot, Deputy Assistant Commissioner (DAC) of Police Adrian Quek has investigated some of the biggest crimes of recent times. The 47-year-old, who will become Assistant Commissioner next month, said: "I joined the force out of a personal passion to become an officer. This is still burning after 20 years." He is one of more than 5,500 Home Team officers to be promoted on June 1. The seasoned investigator, who joined the force in 1993, has been assistant director of the Major Crimes Division since 2011. The division has solved all the murder cases it handled under his charge, including the gory Kovan double murder. Speaking before the Home Team Promotion Ceremony yesterday at Orchard Hotel, DAC Quek said: "One unsolved case is one too many." When asked which case he found the most unforgettable, he cited the 2005 "body parts" murder of Chinese national Liu Hong Mei. He recalled being part of a team of officers who checked rubbish bags at an incineration plant to find the missing head and lower legs before they were burned. He said: "After searching through 3.5 tonnes of trash, we eventually recovered them in time, and this helped to bring closure to the victim's family." Deputy Prime Minister Teo Chee Hean said at the ceremony, where he presented certificates of promotion to 150 senior officers: "When our Home Team officers do their jobs well, we can see the direct and tangible impact in making Singapore a better home for all of us."